So far so good. 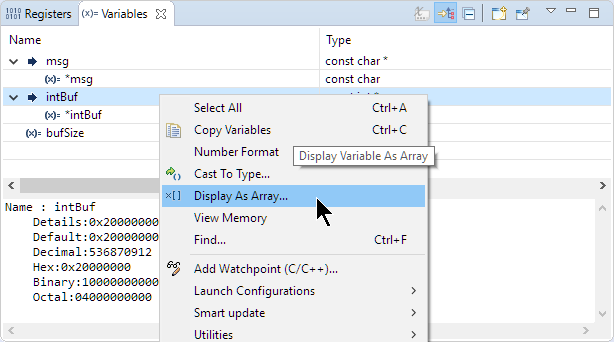 Readers familiar with the C/C++ programming language know that pointers and arrays are kind of interchangeable: a pointer to an element can always be treated as a pointer to an array of elements. 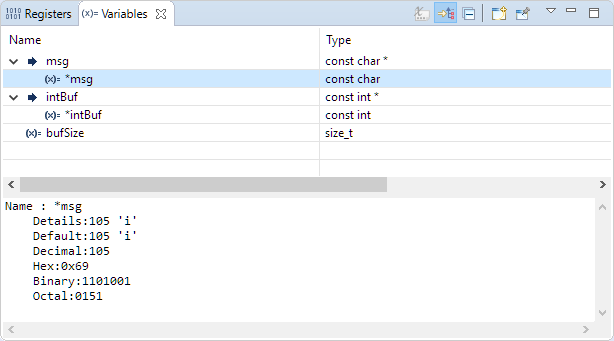 As with the code above, the function printData() receives two pointers which are actually pointers to arrays. 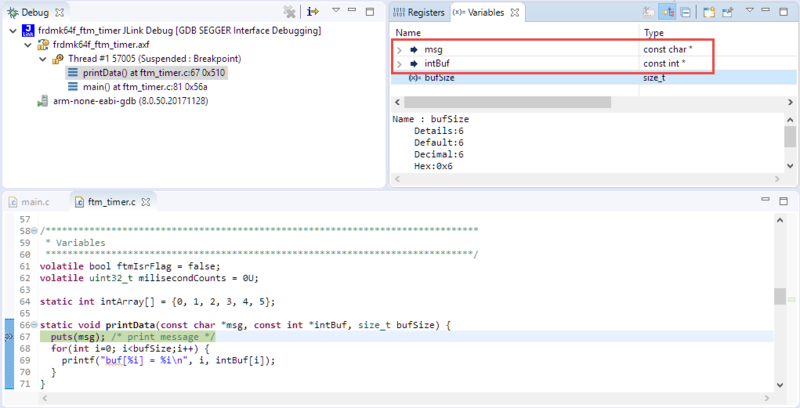 When debugging the function printData() in Eclipse/CDT (shown below with the MCUXpresso IDE 10.2 which is based on Eclipse Oxygen, but it is pretty much the same in any Eclipse version I’m aware of), then the parameters are displayed as normal pointers. Because this is what the function has received and knows about it. 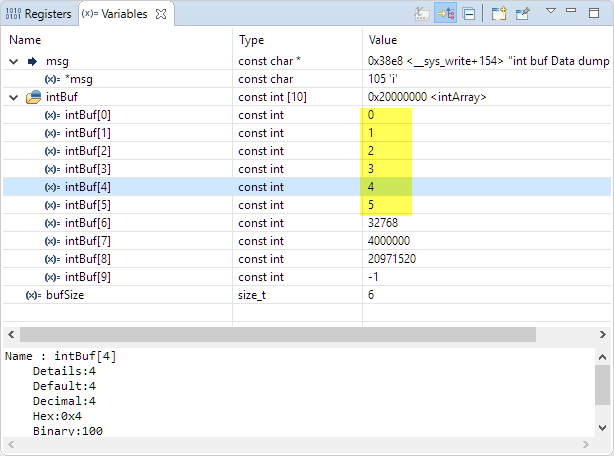 But how to see the full array in the debugger? 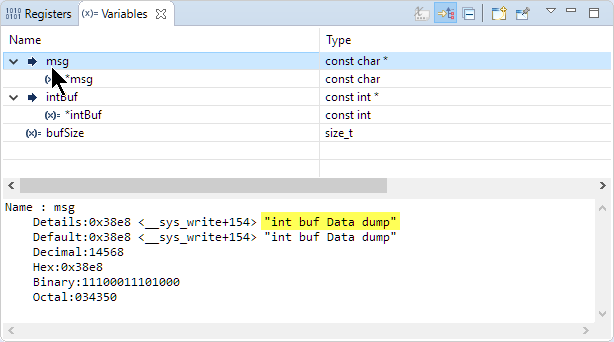 See Eclipse Debugging with Strings and Eclipse Debugging with Strings – Part 2 for a detailed discussion about how to debug string with Eclipse. 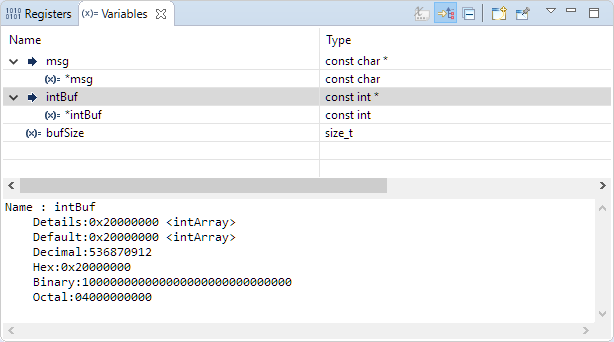 💡 Obviously it will show ‘random’ values if I decide to show more data elements than the array really has defined. 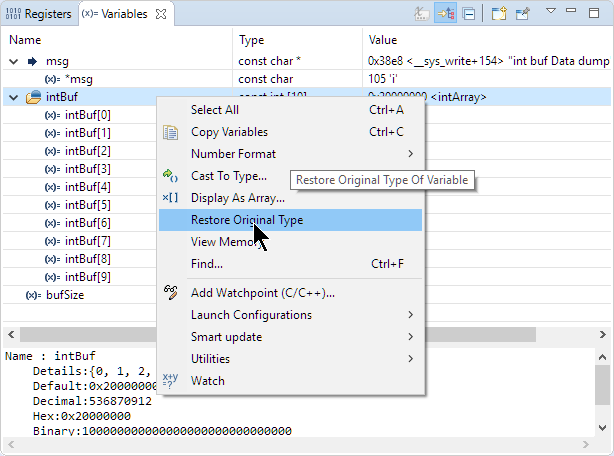 This entry was posted in CodeWarrior, CPU's, Debugging, Eclipse, Embedded, KDS, MCUXpresso IDE, S32 Design Studio, S32DS, Tips & Tricks and tagged Arrays, Debugging, Eclipse, Pointers, Show as Array, technology, Tips&Tricks, Variables, Variables View by Erich Styger. Bookmark the permalink.